As expected, Tuesday featured fewer showers and thunderstorms and therefore warmer temperatures. 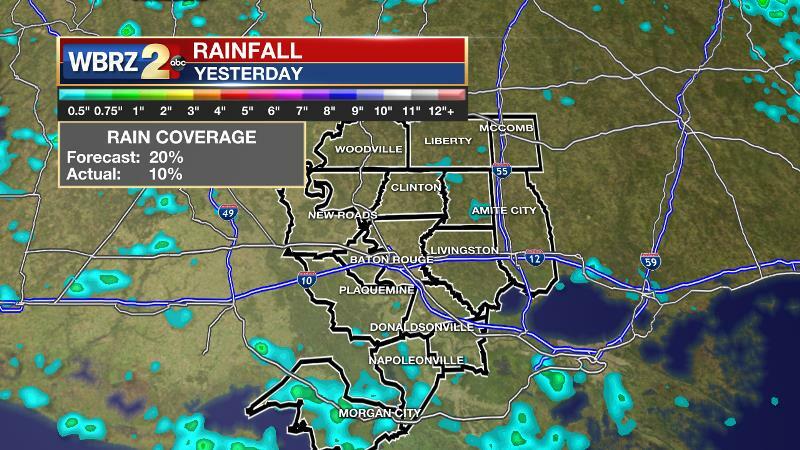 Only about 10 percent of the 13 Parish, 3 County forecast area picked up precip. Rain coverage will come right back up on Wednesday and Thursday. Today and Tonight: After a short break, another active afternoon is ahead. Once high temperatures peak in the upper 80s around lunchtime, scattered showers and thunderstorms will develop. As per summer usual, downpours and frequent lightning will be possible. Storms will drift aimlessly and therefore some nuisance flooding is possible. A quieter night will follow with lows in the mid 70s. Up Next: Thursday will bring activity similar to Wednesday but it does appear that afternoon showers and thunderstorms will trail off from the scattered to isolated category for Friday and the weekend. Temperatures will be close to average. As the tropics are quiet locally, there is not a ton of excitement in the mid-July weather forecast. The Tropics: Chris became the season’s second hurricane on Tuesday afternoon. 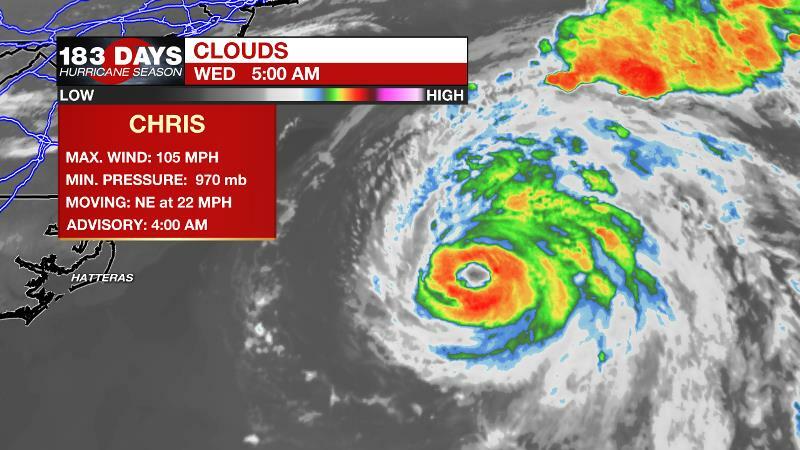 As of 4am Wednesday morning, Hurricane Chris was positioned 300 miles east of Cape Hatteras, North Carolina with 105mph winds and a minimum central pressure of 970mb. The storm is accelerating to the northeast and now buzzing along at 22mph. It will continue to speed up, possibly strengthening a bit more on Wednesday. Thereafter, Chris is expected to transition into a strong post-tropical storm bringing rain and wind to the northeastern provinces of Canada. High surf is the only concern for the Eastern U.S. The remnants of Beryl are producing unorganized showers and thunderstorms near the southwestern Bahamas. This area of low pressure will move into the eastern Atlantic, in Chris’s wake, by this weekend. At that time conditions will be somewhat conducive for reformation and the National Hurricane Center has assigned this area a 50 percent of development. A 500mb ridge that crept over the area on Tuesday and reduced rain coverage has retreated north while a weak surface high has moved south of Louisiana. Combined these two factors will allow more instability and therefore more convection. South of the upper level ridge, a general weakness in heights along with weak, inverted troughs moving across the Gulf will maintain scattered showers and thunderstorms through Thursday. Some advancement of the ridge further south that is currently indicated by models could result in isolated coverage over the weekend but at this time, differences in daily convection are expected to be subtle. Temperatures will be very close to average with highs in the lows 90s and lows in the mid 70s.